The most versatile size in the range, the Scorpio MKII MV will suit a wide range of paddlers with varying requirements. This is the ultimate expedition platform for those who want increased durability over that of a composite sea kayak, making a P&H Scorpio MKII the ideal choice whether you’re an individual with a penchant for rocky launches and carefree beach landings, a professional user who’s out in demanding conditions day in and day out, or a centre whose boats are used and abused by hundreds of clients every year. A sandwich layer polyethylene construction gives the Scorpio MKII’s hull a supreme stiffness-to-weight ratio beyond anything offered by a single-layer polyethylene sea kayak, allowing it to efficiently cut through the waves, whilst also featuring inherent buoyancy and a weight that is easily manageable both on and off the water. The Scorpio shares the same progressive hull profile as its composite counterpart, the Cetus, transitioning seamlessly from a slender bow to a highly stable, slight ‘V’ body with rounded chines, giving a smooth ride and effortless control in all conditions; generous bow rocker means that the Scorpio MKII also runs with the waves like no other polyethylene sea kayak out there. 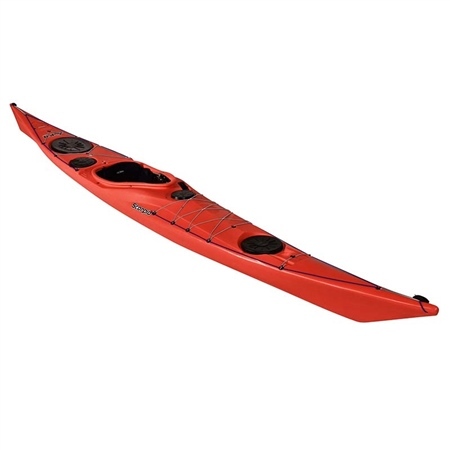 With a whole plethora of other additions such as recesses for secure split paddle storage, moulded-in inserts to take a kayak sail mast foot, and the option of a standard skeg or the revolutionary Skudder system, no other polyethylene sea kayak on the market is as fully featured and ready for adventure as this. Designed around open water expeditions but equally suited to day trip exploration. Versatile, 4-Hatch design; Bow, Stern, Day and Pod (lightly angled for easier access). Moulded-in fittings for fast and simple installation of the P&H sail systems. Lightweight and highly durable bow and double-stern foam bulkheads. Skeg slider positioned on deck to avoid interference with high angle paddle strokes. Low profile back deck and cockpit rim for easy rolling and re-entry. Split paddle and compass recesses on forward deck. Textured P&H logo on deck and hull.